Well I have to say, I had one of the best birthdays I have had in a long time this year. My coworkers are the BEST, and got me the delicious 15 layer carrot cake from The Source in DC. Seriously, if you count the frosting and cake there are 15 layers! Check out the picture below if you don't believe me. Then, the girls made it up with plenty of time to spare...even though they passed a a truck completely on fire, on the drive up from North Carolina. Once again not even joking on this one, and I really thought they were when I first heard about it. So, the bachelorette weekend started with drinks at POV and a fantastic view! It really could not have been a better way to start the weekend and to round out my birthday. 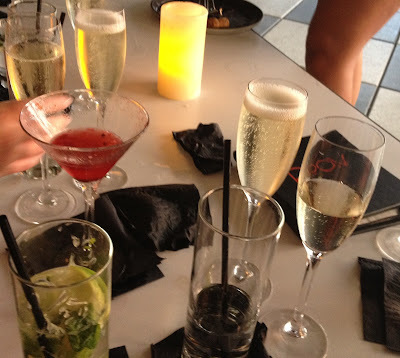 Yes, I need to admit there was a point where we each had about 3 drinks at one time. I need to say thank you to Shawn for that one. Thanks!! Seriously though, POV has the best view in the city for grabbing drinks. Just a quick shot of the sunset...with a view of the White House. Then, after a night of partying, the girls stopped by my house for a quick Sunday brunch, where I totally had mini parfaits...oh and of course mimosas. Okay...Well I figured what better way to round out the weekend and start Monday off right, then to make Margarita Cupcakes. Plus, James and Carolina gave me a challenge to try and make these cupcakes. The challenge being to try and make them taste like the ones at Cake Love. So, challenge accepted. The cake is light with just a hint of lime, and the frosting is smooth with a bit of crunch from the sugar and salt. The frosting is where the true margarita flavor shines with a combination of salt, sugar, lime juice and tequila. So, if you love margaritas you should definitely give these boozey margarita cupcakes a try. Enjoy! Let's get this stuff laid out here...oh and I was totally being lazy and made these cupcakes basically from my coffee table, while watching a movie. Butter and sugar creamed until light and fluffy. Wet ingredients meet dry ingredients...you will soon become one. A little gentle mixing and then into the oven. I wanted to have a lot of frosting on these, so I totes whipped out my cookie scoop. 1 1/2 teaspoon lime juice (Juice the lime you zested for the cupcakes. 1. Preheat the oven to 350 degrees F. Line one cupcake tin with a total 12 cupcake liners and spray with non-stick cooking spray just on the bottom. 2. 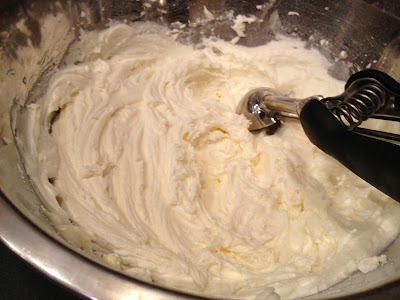 In a large mixing bowl, cream together butter and sugar until light and fluffy. 3. Whisk in the eggs, one at a time, until well combined. Whisk in the vanilla extract and lime zest from one of the limes and set aside. 4. 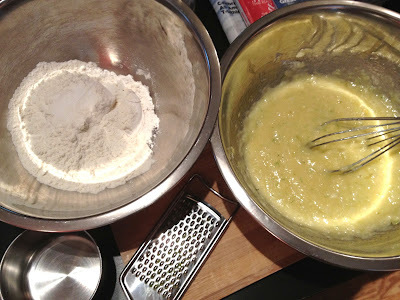 In a separate mixing bowl, whisk together flours and salt. 5. Starting and ending with the dry ingredients, alternate between adding the dry ingredients and milk to the wet ingredients. Mix just until combined. 6. Using a cookie scoop or tablespoon, fill cupcake liners 3/4 full. Bake for 14-16 minutes or until toothpick inserted in the center comes out clean. Let cool in the cupcake tin for 2-3 minutes, then move to cooling rack. While cupcakes are cooling, prepare the frosting. 7. In a large mixing bowl add the butter, then 2 cups powdered sugar, milk, lime juice and tequila. Using an electric mixer, on medium speed, mix together the ingredients for 2-3 minutes or until light, fluffy and smooth. Then add one cup of powdered sugar at a time, mixing for another 2 minutes, after each addition until desired consistency is reached. If your frosting doesn't have enough tequila flavor add a little bit more. Frost the cooled cupcakes. 8. In a small bowl, mix together 1 teaspoon sugar with 1 teaspoon salt. Generously sprinkle the frosted cupcakes with the salt-sugar mixture. Cut and quarter the remaining lime. Dip each side of the lime pieces in the remaining 1 1/2 teaspoons sugar then place a piece on top of each cupcake. Serve or place in the refrigerator until 10 minutes before serving. Enjoy!